With many salespeople the sale is finished the moment the deal is closed. Nothing could be further from the truth. That’s when the sale really begins. A salesperson-customer relationship should be a long term marriage. Repeat business is what adds up to success. This is as true of selling furniture or insurance or real estate or appliances as it is of automobiles. It’s also true of selling ourselves. It’s sad, but many a salesperson has killed all chances of repeat business the moment the sale was closed. He or she did so by forgetting that this is where the SALE BEGINS. I have always said that I not only stood behind the car I sold, but that I also stood in front of it. That means that the customer buys me first. 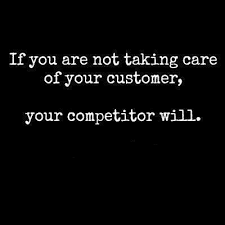 And, if you are a salesperson of a product or a service the customer should be buying you first. It works like this. When you stand in front of your product or service, it puts you between your customer and what he’s bought. After the sale is made, you become his friend—in fact; you must make it a point to do so. I have seen salespeople who, when they see an unhappy or angry customer come back after the close of a sale say –“Here comes that creep,” and will actually hide. They will duck into the washroom. They’ll ask others to cover for them. They’ll do anything to avoid facing and handling that customer. Whether you’ve ducked the customer or passed the buck, that was the moment the long-term sale was lost. Yet, it really should be where the long-term sale begins. Because I “stood in front of the product,” I couldn’t hide. Instead, I would put out that little extra effort to be nice, to take care of something, to go out of my way on the customer’s behalf even though there was no immediate commission in it for me. Ten minutes of my time perhaps, time during which others thought I was making nothing. WRONG I was saving a sale! You must remember that your job isn’t simply to go from sale to sale, putting all of your effort into developing new customers—you must make the time to take care of your existing customers. When you give steady reliable service and keep in constant contact with your customer, whenever a problem does occur, you can work with him to solve it. People are truly grateful for the extra effort you put into servicing them, and they don’t forget it when the time comes to buy again. Repeat sales are so easy and require little effort in comparison to the first time these customers were sold. Considering the amount of time it takes to generate a good lead, no salesperson can afford to lose established customers because of poor servicing. It is many more times expensive and time consuming to gain a brand-new customer than it is to save an old one. Excellence in servicing customers during and after the sale has everything to do with closing sales—future sales. What ultimately assures success is the quality of service rendered. The payoff comes with REPEAT business and referrals by satisfied customers. When you consider how many cars a satisfied customer buys during his or her lifetime, the first one is just the tip of the iceberg. Not to mention how many friends and family members a contented customer will refer to you. It’s a fact that after two years in sales, if you provide outstanding service, 80 percent of all of your sales for the rest of your career will result from existing customers. On the other hand, anyone who fails to provide good service will never realize the building process that comes with establishing a solid base of customers and the fine reputation that ensues.